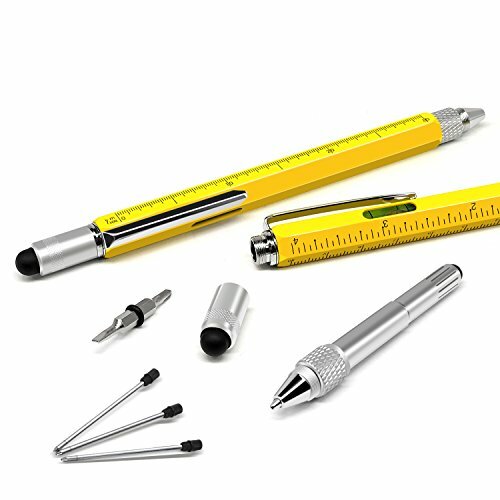 【6 MINI TOOLS】Our heavy-duty and ergonomic pen tool features a handy tablet or smartphone stylus, a sturdy screwdriver, a bubble level, a universal inch/cm ruler and a handy Phillips screwdriver flathead bit! 【GOOD CHOICE】Discover the most versatile and compact level pen multi-tool available by Alintor! The incredible functions and robust design will make it your most trustworthy companion during your weekend projects! 【ALINTOR DESIGN】Unlike flimsy alternatives, our extra strong aluminum screwdriver pen multi-tool has no moving parts that can break easily, plus the vibrant yellow color will make sure you can find it easily and never misplace it! 【BEST GIFT】The 6 In 1 Pen Has a Tremendously Stylish Outer, As Personalized Gifts for Dad or Presents for Men Also Very Good Men Gifts. 【100% RISK-FREE PURCHASE】Ideal for professional and amateur craftsmen, builders, brick and tile layers, carpenters and DIYer, Alintor is Committed to Providing Each Customer Wholehearted Service and Assume Responsibility for Quality of Each Products.